Kathy & Forester's Excellent Adventure!!! Just got back from my first big vacation tour in a LONG time on Sunday, July 18th, 2004, at 7 o'clock. I was gone for two weeks. Had an absolutely WONDERFUL time, even better than I expected to. I had no idea what to expect from this vacation, since I NEVER really ever go on trips. But it all turned out really well and was really fun. Took LOADS of digital photos, so it made for an excellent opportunity to share them all with you! The primary purpose of the trip was to attend the Guild of American Luthiers (GAL) convention, which takes place every three years in Tacoma, Washington, on the Pacific Lutheran University campus. TUESDAY July 6th, I left San Jose around 8 a.m. and arrived in Eugene, Oregon around 4:30 p.m. Stayed in a Motel 6 (as I did in all the other cities I stayed in) that night, and drove the next day to Tacoma, where I registered for the convention around 1 p.m.
On the way, I was just astounded by Mount Shasta --- I kept having to stop along the side of the road to try to get a good photo of it. The photo here doesn't do it justice --- it is a lot more impressive and majestic than this. The convention ran from July 7th through 11th. But this trip was also a good excuse for me, after the convention, to finally see Washington and Oregon, which I'd always wanted to do. 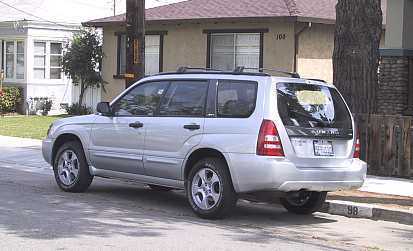 I now had a new car (named Forester) that I trusted, the timing was just right, and it all just came together. JULY 7-11, THE GAL CONVENTION: The GAL convention was GREAT. Met a lot of people whom I've only corresponded with through email (nice to put a face to the name), and met a lot of new people. Had people all over the place looking at me strangely (or looking at me, thinking I looked strange?) and asking me, "Are you that website lady????" I'm usually not so good at social things (I'm too timid to initiate conversations), but it felt really comfortable at this convention. Luthier-type people, for some reason, tend to be really sociable, open-to-sharing, down-to-earth people, and it was really easy to be at ease there. Lots of good music, beautiful guitars (and other stringed instruments), concerts (oud, Pearl Django, classical guitar, etc. ), fantastic seminars (got lots of new ideas and good tips on building). Stayed in the student dorms, was pretty much the only woman on my dorm floor, so I ended up having my own private bathroom at the end of the floor (not bad, huh --- so there are some advantages to being a woman in a male-dominated profession/hobby). Even the dorm food was good (never ate so much in my life --- I usually am fine eating just once a day, but when you've already paid for the dorm food, you tend to adjust to eating three times a day). I even got up the nerve to introduce myself to and spend lots of time talking with some of the more "famous" luthiers during meals. Pretty amazing. I ended up buying some beautiful Malaysian blackwood (really stripey, with an orange band at the centerline) and also some curly koa for a future tenor ukulele. Also found some nice, black mother-of-pearl for Patrick's malamute inlay. 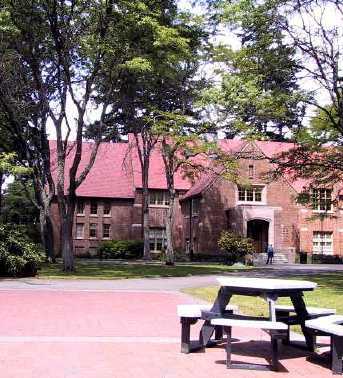 LEFT: This is what the PLU (Pacific Lutheran University) campus looks like --- lots of brick, beautiful landscaping. 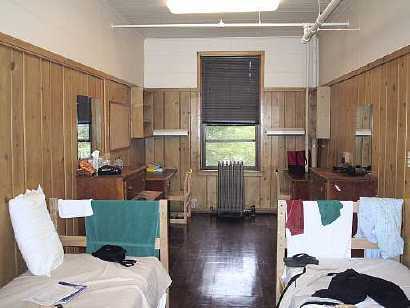 BELOW: My dorm room. I had a single, so I had plenty of room. Attended many fascinating building seminars: Wednesday, Geza Burghardt, Cyndy Burton, and Greg Byers on "French Polish: Techniques that Work" (I've always wanted to try French polishing, and Cyndy Burton also demonstrated her use of epoxy to fill pores on guitar backs --- I intend to try that out on Pat's guitar). Thursday, a captivating lecture by a unique and talented luthier, Fred Carlson, on "Creative Guitar Making: Teaching the Dream to Sing", in which he explained his philosophy and process of building stringed instruments. Also, Jeffrey Elliott speaking on "Restoring Tarrega's 1888 Torres" (which we were able to hear played in concert that evening). The third seminar I attended on Thursday was given by Mike Doolin and John Greven, on "Waterborne Finishing, Revisited", which I had a particular interest in, as I have been using waterborne finishes for a long time now. Friday, Michael Darnton spoke on "Style and Line in Violin Making" --- a really fascinating subject! Later, I went to a presentation by Mike Doolin, Harry Fleishman, and Fabio Ragghianti concerning "Guitar Neck Joints: Attachment Issues". In the afternoon, Charles Fox demonstrated his "Universal Vacuum Island" primarily as a very useful hold-down and gluing device in building guitars. Saturday, Kenny Hill on "So Many Guitars, So Little Time". Later that morning, convention attendees had the opportunity to have their own hand-built guitars played and commented-upon in the "Steel String Guitar Listening" session. Sunday, Rick Turner discussed his recent research in guitar electronics in "Moving into the Future of Tradition", and Tom Ribbecke spoke on "Developments in Archtop Architecture: The Z Axis". These were only the seminars I was able to attend --- there were many other seminars, held concurrently with these --- I really wish I had been able to get to all of them! Oh, yeah --- I almost forgot --- Thursday through Saturday, you had the opportunity to visit Jim Forderer and Jim Westbrook's "Collection of Historical Guitars, 1752 - 1995". WHEW!!!!!! Quite a full, fascinating, and fun five days --- I would go back in a second!!!! Next Page: On to Seattle!! !